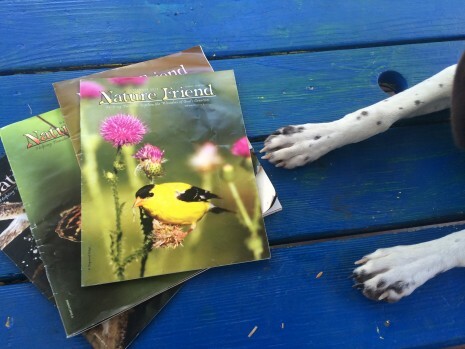 The fun news today is that I have 4 subscriptions to Nature Friend Magazine give away! They are one-year subscriptions, 12 issues each. To enter the drawing, you only need to leave a comment here. You have the option of entering twice if you share it on Facebook, and come back to say so here. Otherwise, please only comment once! I love this magazine! The subtitle is “Helping Families Explore the Wonders of God’s Creation” – and that right there is what I love. You can see how much use these see in our home by all the wrinkly covers – and apparently even our dog is attracted to them. Well, she is a bird dog after all, so maybe that makes sense. This is the only magazine that we get for our kids, and they enjoy it so much. My mom subscribed me when I was little, and I went so far as to write a letter to the editor about my Grandma seeing bear cubs, going to great pains to use the word astonishing. Since my kids have been old enough to read, it has been a constant in our home, and there is always great rejoicing when we find one in the mailbox. So much to learn, things to draw, interesting animals to find out about, beautiful pictures – it really is a delight. I will do the drawing next Tuesday for four different winners. Nature Friend has been so kind as to offer a coupon for our readers who don’t win but want to get the magazine all the same. You can see that info on their website, here. They are also offering a deal right now where every subscription gets you entered in a drawing for a pair of $300 binoculars – one pair for every 50 subscriptions, so your chances of winning are pretty good! You can find out more about that on their website – when you go to sign up, which you totally should!I am sure your kids will enjoy it as much as mine! I am so excited about this! I had no one idea this existed but it is right up our nature-loving alley! A wonderful opportunity to share God’s creation. Thank you! We’d sure love a subscription. So glad to know about the magazine. What a wonderful resource for families! Thank you for sharing with us the fact that this gem exists! Excited to learn of this magazine! I didn’t know this even existed! Looks great! This looks wonderful! My boys would love a subscription! I remember getting this as a child! We loved it. We had a subscription a few years back and loved it! My kids would love this magazine! Fun! I read something similar and had forgotten all about it! I have been looking for a good children’s magazine. Thank you for the opportunity! Regardless I’m excited to be introduced to this magazine! That’s great…I was just thinking yesterday that I want to buy this for my sister’s kids for Christmas. So I will definitely use the discount if I don’t win! My son would love this! Thanks for the giveaway!! How fun! I am not familiar with the magazine, but sounds like something my kids would love. Thanks for doing this! Looks like just the sort of thing my kids would enjoy! Super fun! Loved your emphasis on being hospitable to your own children first in the webinar. Thanks! This looks wonderful! I would love to win this for my nephew! My five would be thrilled! My boys would love this magazine! Days of creation. My students would love this. Our kids would enjoy this very much. Thanks for doing the giveaway! These look awesome! My siblings would love these! Looks like something that would be loved around here as well! My children would love this! We actually just spent nearly an hour watching a huge flock of small birds nibbling bugs from our grass, and then when they were scared away by a magpie and a flicker, my children wanted to get out binoculars to try seeing where they landed in nearby trees. Perfect. My kids get Creation magazine from Answers in Genesis and they love it. I’d love to win a subscription of this magazine for them! My 3 nature loving sons would love this! Wow, how exciting, my kids would love a magazine like this! How exciting! Never heard of it- so glad u shared! I’ve been considering this magazine for my children. The would love it! THis is my first time to hear of this sweet magazine! Thanks for highlighting a fantastic resource! We were given an issue of this last year when our daughter was recovering from hip surgery and we loved it – the magazine that is! We would really enjoy a subscription of our own. Looks like something my children would love! Thanks for the opportunity! I would love to win a subscription to this magazine, and if I don’t win, then that’s a fun Christmas present sorted! And I’ve just shared on Facebook too. I’ve wanted to get my kids a magazine subscription for a while and this one looks great! This looks likes something we would love! Looks great! I shared the link on FB. Love the magazine! Thanks so much for doing the give-away! This sounds great, our children would love it. Thanks for sharing, I’m off to have a look at their website. I have wonderful memories of reading Nature Friend while growing up. I’d love to introduce them to my little ones! I was just thinking that we needed to find a magazine subscription for our littles. Such fu! This looks really neat! My son likes learning about animals so I’m sure he would like this. Fun! My kids would love this! Magazine subscriptions just aren’t in our budget- but this one does look like a gem! We subscribed to Nature Friend a few years back, and really enjoyed its content. We would love to win another subscription! Thanks for the chance to win! I’ve not heard of this magazine, I think my son, especially would love it! Thank you, always looking for things to read with kids that honor God :). I loved this mag as a child too, but my children have yet to experience the wonder! I remember reading this magazine when I was younger! Looks like a fun read for our entire family! Woohoo! What a treat! Sign us up. So glad to know about this publication! We’d love to win! I love this magazine! I used to get this for my kids and saved every single issue. I would love to subscribe again. Our 3 kiddos would LOVE this! Not only for reading for fun but also to go along with our devotions & science for homeschooling about the wonders of God’s creation! 🙂 Thanks for offering this awesome giveaway! So glad you mentioned this! Been looking for a good science magazine for kiddos. Wow, looks like fun for my little guys! I didn’t know about this magazine but it looks great. My kids would love it! What a neat give away! A friend gave us back issues a couple of years ago that we have loved. It would be wonderful to enjoy a new subscription. This looks like a magazine our kids would really enjoy! Thank you for making the offer available! We are starting homeschooling and this would be a wonderful component to our science studies! I’ve been wanting to subscribe ever since you mentioned this on the webinar! & i shared this on FB! this would add another dimension to our kindergarten homeschool science! sure, why not? Getting good mail for a change would be fun!! Thank you for sharing, Rachel, it sounds like a great magazine ! I enjoy reading your books an your blog. Love studying nature and glorifying the Creator! I don’t know this magazine, but I would like to! Great timing! I will check into this for a youngster who is 5. This may work for a grandson of mine. We subscribed to ZooBooks last year. I would love to try this mag! Throwing my hat in the ring! This would be a fun thing to have in our home, what a great giveaway! Cheers! Wow, what a fabulous giveaway- year long snail mail goodness! Thanks for the opportunity! Only in the US or all the way to us? Super fun……right now we get the “Ranger Rick” magazine for our kids. I know this would be well loved in our home by our son! My little ones would love this! Thanks for the giveaway! Thank you! Would love to win this for my kids and husband! I would love this for my mom. She loves watching birds out of her window and has quite the nice set up for the them. She would also love to share the magazine with my kids when we come to visit. This looks like a great magazine!! We had a subscription once and it was THE FAVORITE magazine that came! Would love to win for the kids! I’d love to have a subscription for my kids! My 5 yr old would so love this! She’s been begging for Highlights! My kids (and I) would love this! Thank you! This magazine looks so fun! I’m sure my kiddos would love it. Thank you for hosting this giveaway! What a fun giveaway! My science-loving five year old would love this! This looks like great giveaway. With 4 kids (3 in elem school), I think these would be a hit at my house. Bought a subscription and shared on Facebook! Shared it on Facebook, too. Wow…lots of comments here. I have been a longtime friend of the Wilsons but have never commented. I thought I would get in on the fun too! Thank you! I’m a grandma who is five hours from her grandkiddos ;-( I’ve been emailing them animal pics, facts and coloring pages for us to share learning together 😉 We have had fun doing this! I would love to win this subscription for them! Me, me, me! If we don’t win, this will make a fun Christmas present. Yay for magazines. Never knew about this magazine. Sounds great for the kids! Thank you! So fun! My kiddos would love that! Thanks for the fun giveaway. This looks really neat. I know my son would love it! Honestly, never seen this mag! Looks great. Just looked at the website and one of the back issues. This looks fabulous! My kids would love this! If we don’t win, this will be a great Christmas present. Thanks for the opportunity to win and for introducing us to this magazine! I have some little folk who’d enjoy that. My girls would sure enjoy this magazine ! We used to get it when I was a kid and I still have the copy that has a picture of a fish I drew. My son loves whales and sea creatures and my Mom and I were just wondering if there are any Christians in this field. What a blessing to find our about this magazine– thank you! I was just telling a friend about this magazine today; would they mail to Canada? Please put my name in the drawing; the kiddos would love it! Thanks! Our children would be blessed with this. My girls love nature and magazines so this is perfect! Thanks for introducing us to this! Sounds like such a neat magazine! Thanks for the drawing! How fun! We’d love a subscription! We have a pile of old issues that my children still get out. Ooh, this looks wonderful! I can see our family (my younger siblings especially) learning a lot from these magazines! ooo! good to know about. I was just considering a magazine sub. for my five year old who loves mail. Ohhhh what a wonderful magazine. Thank you for sharing and telling me about it! 🙂 my boy Abram will love these! These books would be great as we begin our homeschool journey! Thank so much for this chance to get a free subscription! We had this magazine years ago. I’d like to get it again for my youngest children. Shared on fb; tried to comment earlier, but there was a WordPress error. I hope this isn’t an extra comment. When I was young we got this magazine. I would love to get it for my littles too. I shared on facebook too. My kids would like this. Thanks for the chance. Love this magazine – thanks for the reminder. We haven’t subscribed in a few years. If I don’t win, will be subscribing again, especially since we are studying life science this year. Pick me, please! My little gooses would enjoy this. Wonder if they post it to NZ? Been thinking about getting this for Christmas since I first heard about it in an earlier post. Thanks for sharing this resource! Looks like a wonderful magazine. My children would love it. Being a mom of 5 boys, this would be a great blessing to our home! Oh, what fun! Since you recommended it the other day, my husband and I had already put this on our list of Christmas presents to get for our son. I know he would greatly enjoy it. Thanks for the opportunity to win! I’ve never heard of this before. Sounds fascinating — my kids would it! Thanks for the chance and for sharing the info, never heard of it! Looks like a wonderful magazine. Pick me! If this includes Canadian addresses, I’m in! I wasn’t familiar with this magazine. Thank you! Hope I’m not too late! Thanks! We love nature friend and have been missing our subscription…. My children love this magazine, but our subscription recently ran out. This would be a real blessing. I’ve obviously been living in a cave! I’ve never seen this mag before :-/ Thanks for sharing!! If it’s not too late…we would love to win a subscription!